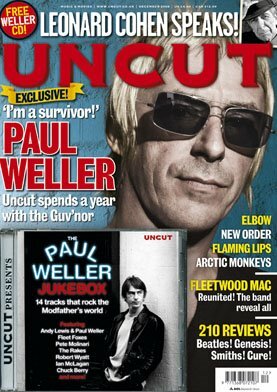 Paul Weller Featured In December Issue Of Uncut! – Paul Weller News! 1 Comment on Paul Weller Featured In December Issue Of Uncut! If Weller at 50 is somewhat flabbergasted, how, you have to wonder, does Leonard Cohen feel at 74? As he prepares for a second leg of sold-out UK dates on what has become one of the most triumphant comebacks ever, you would have to say he seems in rude health and wit. In our second major feature this month, the legendary singer-songwriter talks about going back on the road for the first time in nearly 20 years and why for him, it was ‘now or never’, while key members of his touring entourage tell us how the tour came together and share their memories of some of its highlights so far. Cheers for the heads up on this Dave, it’ll be purchased tomorrow morning ready for my lunchtime read! Previous Entry Paul Weller Interview With The Sunday Mirror! Next Entry Upcoming TV & Radio Appearances For Paul Weller!